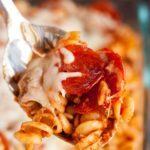 Pizza Casserole Recipe | Easy Pizza Casserole Your Family Will Love! Easy casserole recipe for the pizza lover! In a large bowl, mix together the cooked noodles, browned and crumbled ground beef, spaghetti sauce, pepperoni slices, and half the Mozzarella Cheese. Once mixed, place in a 9 x 13 in dish. Cover with the remaining Mozzarella Cheese. Bake at 350 degrees for about 10 minutes, or until cheese is melted.